If we force the pace of communication too much we risk violating the comprehension speed limit. Speeding up an ad to squeeze a longer message into 30 seconds risks a comprehension nosedive like the Woody Allen experience. Pace is unrestricted on memory expressways however. But how do you get there from here? When we use the remote control to fast forward the ads, all we seem to see is a bit of a blur. However, as I pointed out in a previous column, there are Curious But Real: Effects From Fast Forwarded Ads but only if they are seen previously, a number of times, at normal speed. That fast-forwarded visual blur then registers some of the communication about the brand. The fact is that an ad, a brand or any other type of stimulus takes time to perceive completely. The more time, the more comprehension. If I flash this picture for less than 60 milliseconds, you see a flash but little else. A little longer and you will make out a chessboard. Even longer and you register more detail (like the number of pieces, the state of play and perhaps the emotion that accompanies that pattern of play). Perception demands time but less so when you have seen something before (as with those fast forwarded ads). With repetition, perception is ramped onto memory-forged expressways. 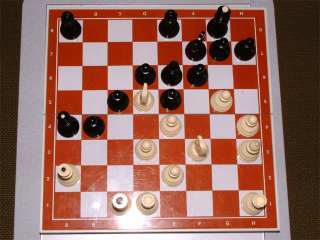 To use the current example, if I show you a real chessboard and then after a few seconds remove the pieces, how many could you place back on the board in the same position? Most people struggle with 4 or 5 whereas chess experts succeed with 20 or more pieces! They have seen such a pattern many times before so express perception lets them perceive (and retain) more in a shorter period of time. Express perception is a magic key to competitive advantage not just in chess but also in brand communication. As a brand becomes more familiar it is not only noticed more quickly in displays but it increasingly also registers with more meaning i.e. with image-attributes and emotions infused into the brand identity. When messages and emotions, repeatedly linked to a brand, become infused, it compresses the perceptual intake time because they are then part of the identity itself. An important part of brand equity is the ability to stand out caused by rapid recognition-speed as well as the extra meaning. It is easy to miss the very subtle but important point here. Branding is really a form of perceptual acceleration that compresses meaning into the identity. For established brands, it enables vastly accelerated perceptual identification as well as meaning comprehension. Mental Templates It is helpful to think of a brand as being like a mental template. We are rarely aware of mental templates forming but we can appreciate that they do if we consider how it happens with simple words. Take a word like ‘antelope’ for example. Recognize it? What about iPhone? Of course, you brought to mind an entity and the constellation of associations triggered by that entity. But ask yourself this question: Why didn’t you just see individual letters - a n t e l o p e and i P h o n e as you did when you were first learning to read? Because you have a mental template activated by this pattern of letters. As a result, the intake process has become so rapid that it no longer takes much sequential thought but instead registers as a compact identification, almost instantly finding its match in memory and delivering itself complete with mental associations. Perception is richer as a result… and if not instant, then vastly accelerated. It is helpful to think of a brand as being like a mental template. We are rarely aware of mental templates forming but we can appreciate that they do if we consider how it happens with simple words. Take a word like ‘antelope’ for example. Recognize it? What about iPhone? Of course, you brought to mind an entity and the constellation of associations triggered by that entity. as you did when you were first learning to read? Because you have a mental template activated by this pattern of letters. As a result, the intake process has become so rapid that it no longer takes much sequential thought but instead registers as a compact identification, almost instantly finding its match in memory and delivering itself complete with mental associations. Perception is richer as a result… and if not instant, then vastly accelerated. This acceleration process works not just with words and brands but also with moving images like TV and web ads. Just as a brand accrues advantage by compacting perceptual time into a template, so a brand’s ads can be compacted into a template and achieve express perception. A 60-second TV commercial, on air for a week or two, followed in subsequent weeks by a cut down 30-second version to act as a reminder. The longer version is used to build a mental template in viewer’s minds and the short version retriggers it. Nowadays the cost of 60-sec. commercials is rather prohibitive so a 30-second ad at the start of the commercial break is more often used with a 15-second cut-down version following at the end of the same break. A key reason why these two strategies work so well is that they get viewers to fill-in bits of the ad reflexively from memory. They maximally accelerate learning and perception by engaging the viewer’s self-completion processes. When self-completion gets behind the wheel, perception takes the fast lane. The brain accelerates future intakes by evolving an ever-more-complete mental template. The result is that more can be successfully communicated in a much shorter time. This means you arrive at that destination of competitive advantage faster while competitors are still caught up in more restrictive speed zones. To circumvent biologically enforced, perceptual speed limits, exploit the subtle dimension of time by ‘compressing’ communications into a template. Just as you can build a mind template for your brand, so too can you do the same thing with your ads. It is all about compacting perceptions to enable accelerated communications to let you cruise along at unrestricted speed enjoying a significant communication advantage over competitors. That is why less developed brands and less developed ads are so often at a competitive disadvantage. Download a PDF copy of "Acceleration of Communications. Destination Competitive Advantage"